LONDON, (AFP) -- A car crashed into barriers outside Britain‘s Houses of Parliament in a suspected terror attack on Tuesday, injuring a “number of pedestrians” yards from where five people were killed last year. Police said they had arrested the driver, in his late 20s, and were holding him on suspicion of terrorist offences. “At this stage, we are treating this as a terrorist incident,” said Scotland Yard, adding that none of the injuries are believed to be “life-threatening”. Footage shows the silver Ford Fiesta veering across an intersection, hitting a number of cyclists and pedestrians, before speeding into a barrier outside the Houses of Parliament at 7.37 am (0637 GMT). Another recording shows injured cyclists and pedestrians lying in the street in the immediate aftermath of the incident. Armed officers swooped in to arrest the driver, removing him from the vehicle at gunpoint. Later images showed police holding the man, dressed in jeans and a black puffer jacket, in handcuffs as roads and Underground stations around parliament were sealed off. “The driver of the car, a man in his late 20s... was arrested on suspicion of terrorist offences,” said police. Police have yet to identify the suspect, who was not cooperating with detectives, said Metropolitan Police Assistant Commissioner Neil Basu. London Ambulance said they had treated a man and a woman at the scene and taken them to hospital. The man was later discharged, while the woman remained in hospital, where she was being treated for serious but non-life-threatening injuries, according to Basu. Prime Minister Theresa May, currently in Switzerland, tweeted that her “thoughts are with those injured in the incident in Westminster”. Government officials will hold a meeting of the emergency Cobra committee at 2.00 pm. Witness Ewalina Ochab told the Press Association that the incident “looked intentional”. “I was walking on the other side. I heard some noise and someone screamed,” she said. Eyewitness Jason Williams, 45, also said that the incident looked deliberate. ”I saw a car going at high speed towards Parliament. It hit a bollard,“ he told the Press Association. Mayor of London Sadiq Khan said ”all Londoners, like me, utterly condemn all acts of terrorism on our city. “The response of Londoners today shows that we will never be cowed, intimidated or divided by any terrorist attack,” he said. 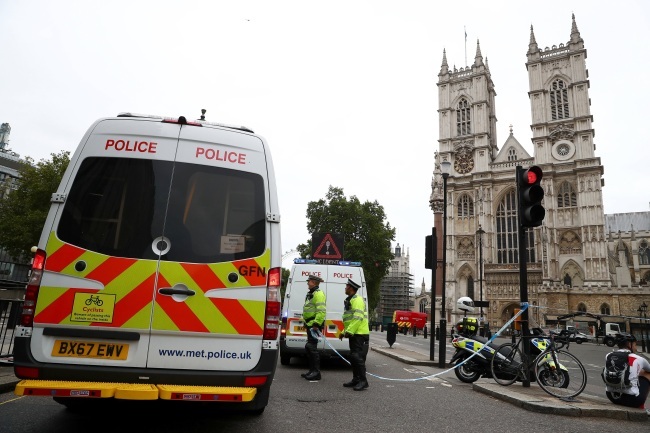 Westminster was the scene of a terror attack last year, when Khalid Masood, a 52-year-old British convert to Islam, drove a car at pedestrians on a bridge over the River Thames, before fatally stabbing a policeman on guard outside parliament. The attack left five people dead and around 50 injured, and only ended when police shot Masood dead. Britain endured a tumultuous period following the March 22 rampage, with four further terror attacks within months. Twenty-two people -- including children -- were killed in a bomb attack at Manchester Arena on May 22 and eight people were killed weeks later when a van ploughed into people on London Bridge. Far-right extremist Darren Osborne killed one man after ramming his van into Muslim worshippers in north London on June 19, while 51 people were injured when Ahmed Hassan, 18, planted an explosive device, that partially exploded on an Underground train.